Use with ClearSkin-A Gel, a herbal medicated gel for added effectiveness and protection against new outbreaks! Do you suffer from Acne, Rosacea, Scars? Is your skin affected by a hormone imbalance? 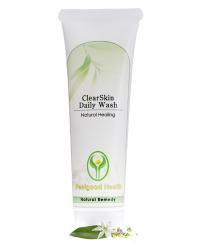 What is ClearSkin Daily Wash? How has ClearSkin Daily Wash helped others? How do I use the Acne Pack? Three Easy Steps! Acne is the plague of many teenagers and young adults and can result in embarrassment, social withdrawal and low self esteem. Even more mature people as well as women going through the menopause can suffer from acne due to hormonal imbalance, stress and unhealthy lifestyles. How many times have you felt like hiding yourself away because of eruptions on your face and neck? How often have you decided to stay at home while your friends are out having a good time? Is unsightly acne spoiling your chances of finding someone to love? Have you spent a fortune on different products and medication which claim to give you a perfect skin - only to find that your problem becomes worse and worse? The main causes of acne are spreading of infection from blocked oil ducts in the pores of the skin. In order to remove pimples as quickly as possible and to prevent the spread of infection, many people use products like astringents and salicylic acid to dry out the pimples . While this can have a temporary effect it often makes things worse with patches of dry flaking skin added to the acne. The worst thing that one can do with acne is to confuse the skin with lots of different chemicals which upset the delicate Ph balance and often result in drying and scarring. Hormone imbalances can be caused by a variety of factors and can occur at any time of life, although teenagers, pregnant women and women going through the menopause are most vulnerable. An imbalance in the ratio between progesterone and estrogen or excessive testosterone production in women can result in various symptoms, including acne. Xeno-estrogens, or synthetic estrogens found in the environment, food or water supply, as well as synthetic hormones in the contraceptive pill and HRT are also thought to be responsible for affecting the sensitive hormonal balance. Stress can also play a big role in causing hormonal imbalance. For many women, an imbalance in hormonal functioning is a major cause of acne. Using our ClearSkin-A Gel together with Don Quai (natural hormone balancing capsules) will help to restore healthy female hormonal balance and prevent acne outbreaks due to hormonal factors. The skin reacts to what we put on it as well as what we put in our bodies. In fact, the best way to support healthy skin is to make sure that it is part of a healthy body! This means that regular exercise (as well as a healthy diet) is key to promoting a healthy skin. Plenty of fresh, raw fruit and vegetables and nourishing nuts can do wonders for a tired and troubled skin. Keeping your skin care routine as simple and as gentle as possible is also a must to maintain skin pH and oil balance. Oily skin is often a sign of incorrect diet and over applying harsh chemicals – causing the skin to produce more oil to protect itself. Herbal ingredients have the best chance of naturally supporting skin health, without upsetting skin balance. We recommend a combination of our herbal ClearSkin-A Gel used when necessary on targeted areas for best effect. You will be amazed how quickly your skin responds! ClearSkin Daily Wash is a 100% herbal medicated skin wash specifically formulated by Feelgood Health as a complement to our popular ClearSkin-A Gel treatment. Using herbs carefully selected for their healing and tonic effects on the skin, ClearSkin Daily Wash together with ClearSkin-A Gel provides a complete treatment solution for even the most stubborn acne conditions. "When are you going to produce more? This stuff is fantastic!" "I used it every day and it works so well. My face is clear for the first time since my teens." "I just couldn't get over how soft my skin felt after the very first wash. All the other medicated products that I have tried have dried my skin, but this cleared my skin AND it felt ten times softer and looked so healthy and fresh." "This combination of ClearSkin-A Gel and ClearSkin Daily Wash is the first thing that has EVER worked for my skin without leaving it dry and ugly. I even found that I can shave more easily without cutting myself all the time now that my skin is clearer and less inflamed." Arctium lappa is used naturopathically for the treatment of all chronic skin conditions, including acne, eczema, psoriasis and canker sores. It has even been used by traditional healers to treat snake bite. Its antibiotic and antibacterial properties make it a highly effective treatment for all chronic and stubborn skin problems. Bulbine frutescence is indigenous to South Africa and is widely used by traditional healers to treat a wide range of skin complaints. Commonly called Bulbinella, bulbine is effective in preventing skin infection, healing and soothing cuts, rashes, insect bites, burns, cold sores, pimples and other skin problems. Its clear and soothing gel forms an invisible 'seal' over the wound, protecting against bacteria and providing ongoing relief and healing throughout the day. Lavender essential oil: Lavender is one of the most useful popular herbs with a range of uses. The name Lavender comes from the Latin word 'lavare', which means 'to wash', giving a good indication of its cleansing properties. It is also a circulatory stimulant and antiseptic and is used naturopathically to treat wounds and burns and to prevent scarring. Azadirachta indica is widely used in Ayurvedic medicine for its cleansing, anti-bacterial and anti-inflammatory properties. Melaleuca alternifolia (Tea Tree Oil) is a traditional remedy of the Aboriginal tribes of Australia. Studies have shown that it has exceptional healing powers due to its anti-bacterial, anti-fungal and anti-septic actions. Tea Tree Oil was included in the wound dressing kits of the Australian troops in World War 2. It is one of few healing oils which can be used neat without irritating or drying the skin. Aspalathus linearis (Rooibos) is an indigenous shrub, which grows exclusively on the slopes of the Cedarberg mountains in the Western Cape province of South Africa and has been used by traditional healers of the area for centuries. Now known worldwide for its anti-oxidant and healing properties, the soothing and healing effect of Rooibos on the skin is remarkable. The skin is the largest and most complex of all our body organs and can be very sensitive to stress, environmental pollution or unhealthy diets and lifestyle (junk foods, alcohol, smoking, drug use, insufficient sleep, etc). Herbal Detox Drops to cleanse your system from the inside. A healthy skin depends on a healthy body and efficient removal of toxins. Using ClearSkin-A Acne Gel together with ClearSkin Daily Wash and Detox Drops will help to fight against acne in three different and very effective ways. Wash your skin every day, morning and evening with ClearSkin Daily Wash.
Use ClearSkin-A Acne Gel on your skin wherever you have existing pimples. After this initial treatment, continue to cleanse skin with ClearSkin Daily Wash and use ClearSkin-A Acne Gel whenever necessary, simply applying a small amount to the first appearance of new pimples. This will effectively stop the new pimple in its tracks and prevent spreading to the surrounding area. You will find a significant improvement in skin appearance with fewer and fewer pimples. Improvement should be noted within 24-48 hours, provided that skin is kept clean and eruptions are not squeezed or picked at. One tube of ClearSkin-A Gel applied three times daily will last 20-25 days, depending on the amount of gel needed. ClearSkin Daily Wash is concentrated and only a small amount is needed for each application. Lasts approximately 3 - 4 weeks with normal use.